and underscore my sense of loss. some sand to stick my head beneath. that she thought was being conveyed. is dreary and full of woe! We are not the problem here. We watch serene, your freak out scene. We see your strengths, your skills, your care. We know you’re kind and very fair. You’re really great. Don’t be irate! You perceive attacks where there are none. There’s no one talking at your back. Each based simply on illusions. and when people are contentedly accepting you. you choked down his hurt. he saw anguish curling lithely behind your eyes. What workshops will I attend? Yes. That one. This one. A memory like this one. 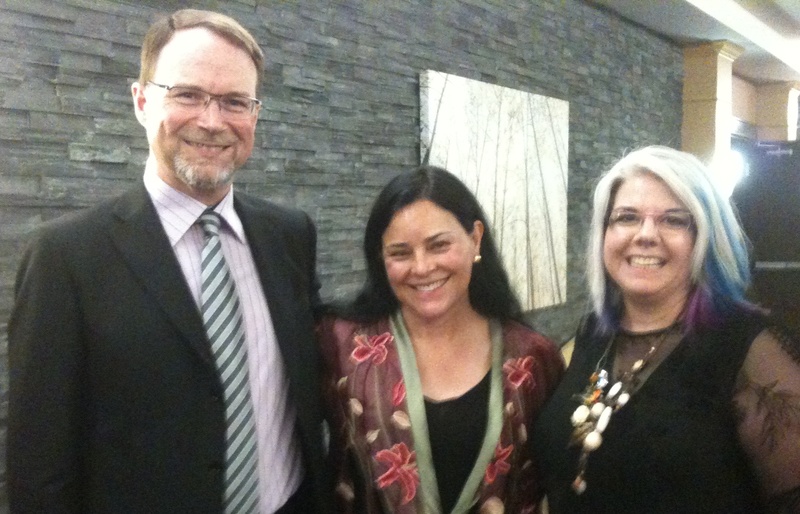 My dear husband, grinning broadly with Diana Gabaldon beside him outside the conference banquet. This is the first time he’s met an author whose work he admires. I’m laughing because I just had to sprint down the hall to get into the photo. Despite being with Diana all weekend and snapping many photos of her with/for other people, this moment was the only one I had taken with her myself this year.